Loupe says the course will challenge golfers from tee to green. And playing this golf course in the fall only makes things that much more difficult for even the most proficient golfer. Loupe says golfers better stay in the fairway if they want to hit those greens. “It’s a great test and a great golf course,” he said. And most great tests and great golf courses come with great history. The two Ohio State University golf courses (Scarlet and Gray) are considered by many to be masterpieces in classical golf course architecture. Dr. Alister MacKenzie, a world-renowned golf course architect, submitted the original routing plans to Ohio State’s Athletic Director L.W. St. John in January 1931, and construction of the Scarlet course was overseen by famed architect Perry Maxwell. The Scarlet Course was completed in 1938 and the Gray in 1940. 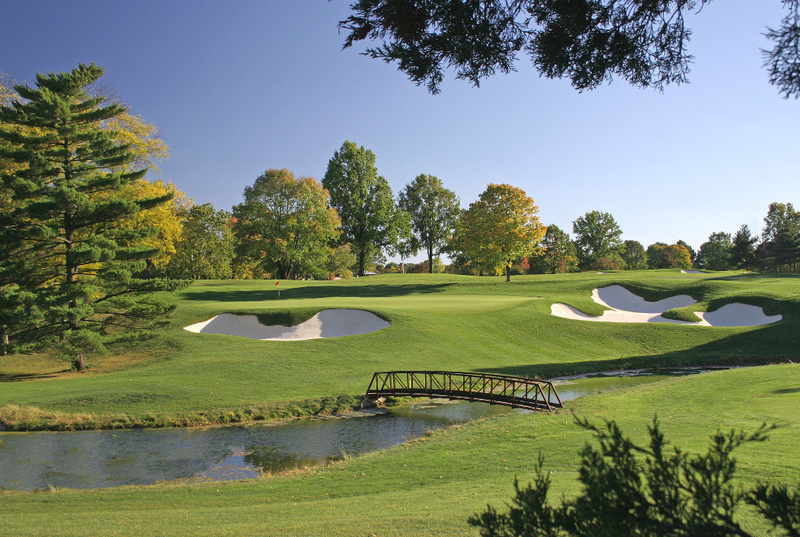 In 2005–06, the Scarlet Course underwent a major restoration project overseen by Buckeye legend Jack Nicklaus, who concentrated on restoring the course to the way MacKenzie originally intended it to play. The course also was lengthened to play to more than 7,400 yards and the par was changed to 71. The driving range was also enlarged and a short-game practice area was built for both of the varsity golf teams as well as another one for the members of the club. Brian Kelly, head golf professional at The Ohio State University Golf Club, says the Scarlet Course is in excellent condition heading into this week’s Nationwide Children’s Hospital Championship. Kelly then added an asterisk to his comments. “Unless we get rain,” he said. “But if the conditions stay how it is now, it favors someone who can bomb it and hit very high iron shots,” he said. “You have to drive it well here and you are going to have to putt it really well here to be successful. The key will be whoever hits the best high iron shots.”Lucas said OSU and the Scarlet Course are proud to host one of the Finals events on the Web.com Tour. This year’s event is the 10th playing of the Nationwide Children’s Hospital Championship. Since the tournament’s inception in 2007, the pediatric cancer program at Nationwide Children’s Hospital has been the primary beneficiary of the tournament. The 2015 event raised a single-season record donation for pediatric cancer research and treatment at Nationwide Children’s in the amount of $1,253,322. To date, the tournament has raised more than $5.7 million in support of the hospital’s pediatric cancer program. Nationwide Children’s Hospital, also the beneficiary of the Memorial Tournament presented by Nationwide, has been caring for sick and injured children and adolescents for more than 120 years. Today, the hospital is America’s fourth-largest and busiest pediatric hospital and research center serving patients from all 50 states, and 21 foreign countries. Nationwide Children’s offers services in every pediatric specialty with a staff of more than 8,500 physicians, scientists and support staff ensuring the best possible care. As an extension of their philanthropic support, The Web.com Tour Wives is partnering with the Nationwide Children’s Hospital Championship to “Fill the Cart with Fun.” While at the tournament, The Web.com Tour Wives is inviting patrons to help fill golf carts with games, toys, crafts and more that will benefit the patients of the Pediatric Cancer Unit at Nationwide Children’s Hospital. Another tournament initiative, Pros fore Patients, was held earlier this week to highlight children, appropriately named “Patient Champions,” who are battling, or have battled, pediatric cancer at Nationwide Children’s. The Pros fore Patients campaign gives the Patient Champions and their families an opportunity to meet and interact with Web.com Tour and PGA TOUR players from the tournament’s field of competitors in a number of special activities, including a putting challenge, hitting stations, lawn games, face painting and more. The seven Patient Champions and their families, along with the Tour professionals, also created care packages to be delivered to inpatients at Nationwide Children’s Hospital during tournament week. Jack and Barbara Nicklaus have supported Nationwide Children’s Hospital since the Memorial Tournament presented by Nationwide was founded in 1976. “Barbara and I said a long time ago that if we were in a position to help somebody, it would be kids. So when we started the Memorial Tournament, Nationwide Children’s Hospital, which saved my daughter’s life when she was less than a year old, was the beneficiary from day one,” Nicklaus said. For more information about the Nationwide Children’s Hospital Championship, visit ncc-golf.com.